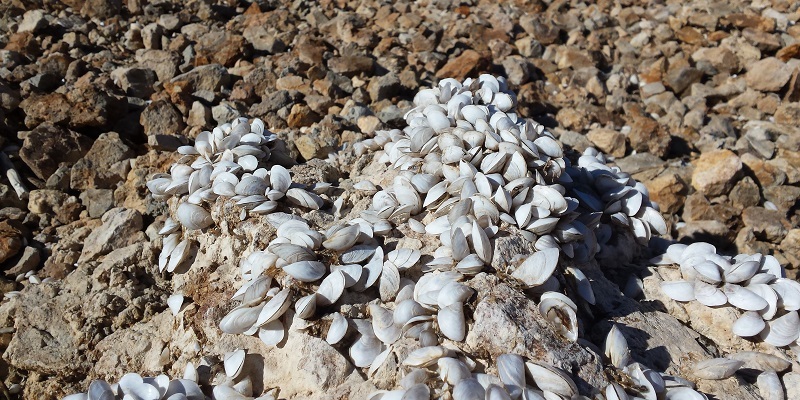 Quagga and Zebra (Dreissenid) mussels pose a serious threat to California's waters and fisheries. The spread of these freshwater mussels threatens recreational boating and fishing, aquatic ecosystems and fisheries, water delivery systems, hydroelectric facilities, agriculture and the environment in general. As a means to stop the spread of these harmful invasive mussels, California is asking boaters to clean, drain and dry their boats! Boaters should be prepared for inspections throughout the state designed to help ensure California's water bodies remain mussel-free. Properly cleaning and drying can help protect boats and help boaters avoid quarantines or being turned away from a water destination. In addition to being sure to clean, drain and dry watercraft, the Division of Boating and Waterways urges boaters to plan for possible launch restrictions and inspections by calling water bodies before leaving home. Programs and requirements vary and can change rapidly. California registered vessels using fresh water bodies within the state are required to display a “Mussel Fee Paid” sticker on the hull next to the current registration sticker. Paying the Mussel Fee does not entitle vessels to bypass inspections or fees for inspections conducted by individual reservoir owners or managers. The information below is provided as a courtesy by the State of California. For further information on the Quagga and Zebra mussels incident, please visit the Department of Fish and Wildlife's Website. Please view the Watercraft Inspections/Vessel Restrictions section for information on California waterways with vessel restrictions to stop the spread of mussels. What do I need to do to make sure a fee is not imposed on me? To prevent receiving a DMV Mussel Fee be sure to know what the Mussel Fee Paid sticker requirements for California registered vessels (PDF) are. If you have any further questions on the matter, please read our Quagga and Zebra Mussel Infestation Prevention Fee FAQ's (PDF). How do I claim the exemption? Check the appropriate box on the Vessel Renewal Notice. Verbally notify the department through the Interactive Voice Response (IVR) system at 1-800-777-0133. Submit a completed Statement of Facts (REG 256) form. For original vessel registration applications, the vessel owner may claim the exemption by checking the appropriate box on the Application for Registration Number Certificate of Ownership and Certificate of Number for Undocumented Vessel (BOAT 101) form or submitting a completed REG 256. Why are marine water boats exempt from paying the Mussel Fee? Quagga and Zebra Mussels only live and reproduce in fresh water. 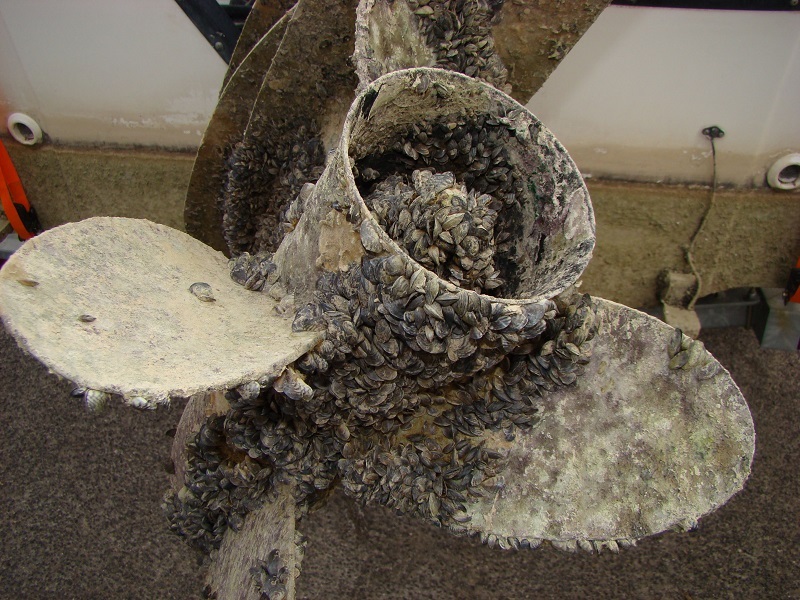 Boat owners that do not operate in fresh water are exempt from the Mussel Fee for this reason. What if I pay the fee but then become marine exempt because I no longer use my boat in fresh water? A refund of the Mussel Fee paid upon original vessel registration and vessel registration renewal is subject to established DMV business rules and processing procedures. See: application for refund. I have always used my boat in salt water, but I am thinking of occasionally using it in fresh water such as the Sacramento River or a reservoir. Do I need the stickers? Yes, you will need to go to a DMV office and purchase the Mussel Fee stickers. Will my Mussel Fee stickers allow me to boat in any fresh water reservoir or river without paying for an inspection or cleaning? The Mussel Fee stickers do not pay for individual boat inspections that may be required by local water agencies. 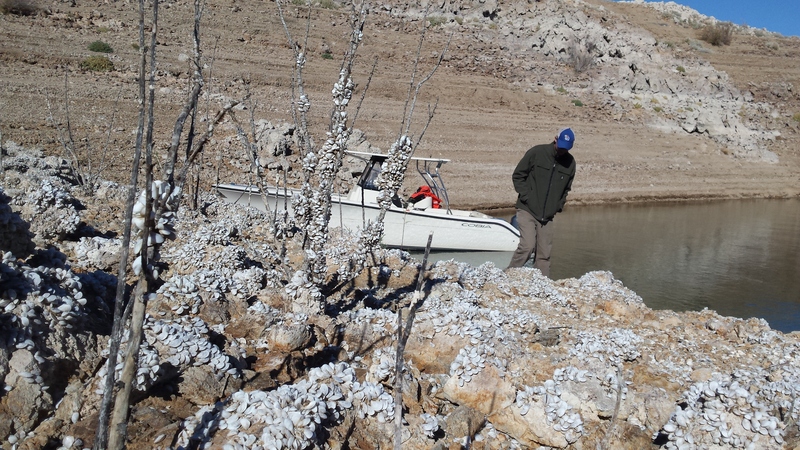 Boat inspection programs are implemented by the water managers and are varied. Please contact the particular waterbody directly for information regarding their program and requirement prior to your visit. View this California watercraft inspection list for contact information. Are Coast Guard documented vessels or out of state boats visiting California fresh water required to pay the Mussel Fee? What if I do not pay the fee or do not place the stickers on my boat? Law enforcement officers may stop a fresh water boater operating a vessel without the Mussel Fee stickers. Where do I place the Mussel Fee stickers? Stickers are to be placed on each side of the boat, next to, and in line with the CF number and vessel registration sticker. Click here for a more in depth look at the Mussel Fee Paid sticker requirements. What if I lose the stickers or they are removed or damaged on my boat? Can I get replacements? If boat owners lose the stickers or the stickers are damaged, substitute stickers may be obtained from DMV for $16. Can this replacement fee be waived? The fee is waived only for a replacement/substitute sticker when the vessel owner indicates on DMV's Application for replacement Plates, Stickers, and Documents (REG 156) form that the original stickers were not received from DMV. How do I get Mussel Fee stickers if I purchase a new boat? DMV will collect the Mussel Fee and provide stickers when you register your new boat. What are Quagga and Zebra mussels? 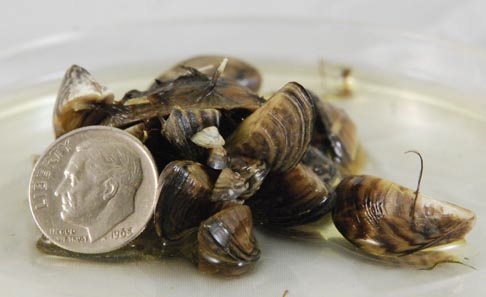 Quagga and Zebra mussels, non-native freshwater mussels native to Eurasia, multiply quickly and encrust watercraft and infrastructure, and they compete for food with native and sport fish species. 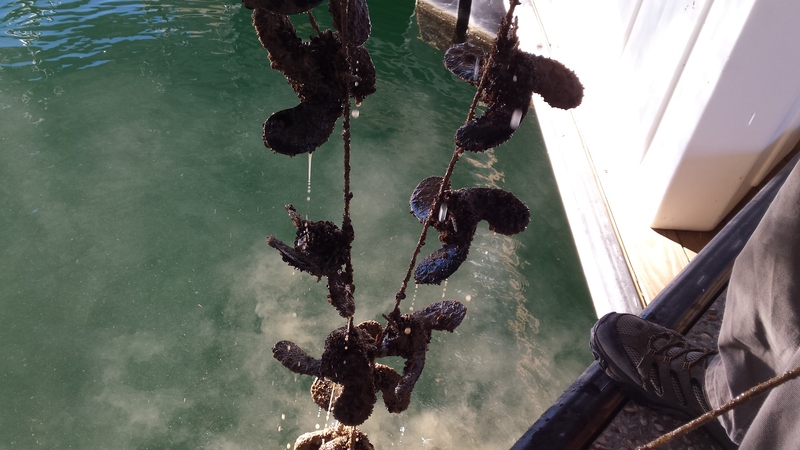 These mussels can be spread from one body of water to another by attaching themselves to nearly anything that has been in an infested water body or via standing water from an infested waterbody entrapped in boat engines, bilges, live-wells and buckets. More detailed information on these mussels may be found on DBW's website. 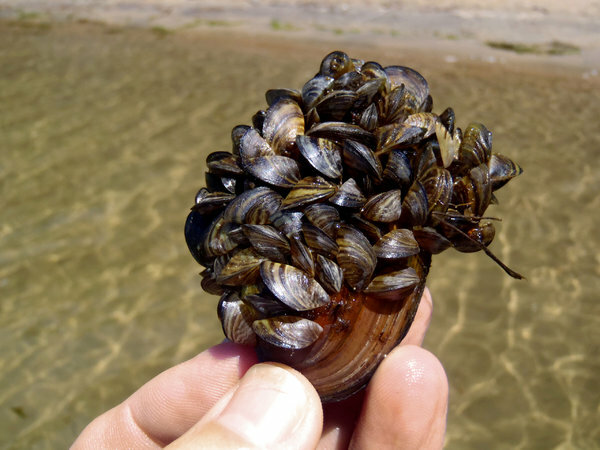 What is being done in response to Quagga/Zebra mussels? Increased watercraft inspections at California Department of Food and Agriculture Border Protection Stations. Development and implementation of monitoring plans for high risk water bodies in the state. Training of state, federal and local agency staff and K-9 units to conduct watercraft inspections and monitoring. Public outreach and education to watercraft owners through print and online media, outdoor signage and distribution of information at public/media events. (e.g., a Boat Cleaning Guide Book, watercraft inspections contact information, etc.). More information can be found on DBW and/or CDFW websites. * California Departments of Fish and Wildlife, Water Resources, Food and Agriculture, Parks and Recreation/Division of Boating and Waterways, Cal Fire, CalTrans, State Water Resources Control Board, Regional Water Quality Control Board, State Lands Commission, Natural Resources Agency, U.S. Fish and Wildlife Service, U.S. Forest Service, U.S. Army Corps of Engineers, U.S. Geological Survey, National Park Service, U.S. Bureau of Reclamation, U.S. Bureau of Land Management, Pacific Gas and Electric and Metropolitan Water District of Southern California. The Legislature enacted Harbors and Navigation Code, Division 3, Chapter 5, Article 1.3 Sections 675 and 676, which became effective January 1, 2013. The statute requires the Department of Parks and Recreation, Division of Boating and Waterways, (DBW) to promulgate regulations to impose an additional Quagga and Zebra Mussel Infestation Prevention Fee to the boater registration fee collected by the Department of Motor Vehicles, for the purpose of funding infestation prevention programs in California's reservoirs.